President Moon Jae-in on Tuesday met with Korean soldiers stationed in the United Arab Emirates, and met with the ruler of Dubai, wrapping up his trip to the Middle Eastern state. 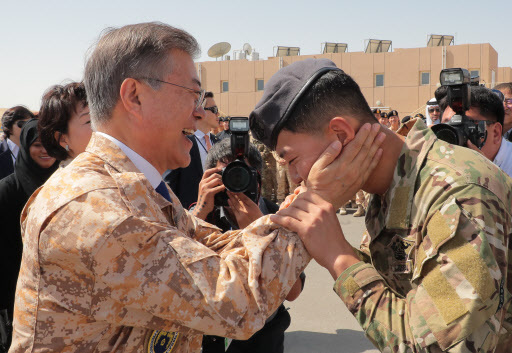 Moon began his final day in the UAE with a visit to the Korean military unit, Akh. The unit has been stationed in the UAE since January 2011, tasked with aiding the training of UAE soldiers and protecting Koreans in the country in case of a military conflict. “The Akh unit is the pride of Korea’s armed forces, and the symbol of cooperation between Korea and the UAE,” Moon said, adding that the unit was instrumental in the two countries forming a relationship of special strategic partners. Following the visit to the unit, Moon met with Mohammed bin Rashid Al Maktoum, prime minister of the UAE and ruler of Dubai. Moon also attended a Korea-UAE business forum in Dubai before his scheduled departure for Seoul. On Sunday, Moon met with Crown Prince of Abu Dhabi Mohammed bin Zayed Al-Nahyan and agreed to raise bilateral relations to that of special strategic partners. As part of the agreement, the two sides plan to boost cooperation in a wide range of areas from defense and diplomacy to energy and construction. In a meeting with Koreans based in the UAE on Sunday, Moon took the opportunity to emphasize the strength of bilateral relations, downplaying recent reports about a possible discord. After it was revealed that Moon’s chief of staff Im Jong-seok visited the UAE as a special envoy in December last year, speculations rose that tension was rising between the two countries over agreements reached under previous administrations. Moon’s trip has also served to broaden the involvement of Korean corporations in the UAE’s state projects. Cheong Wa Dae spokesman Kim Eui-kyeom revealed Tuesday that the UAE has drawn up plans for close cooperation with Korean companies including petroleum- and gas-related projects amounting to some $25 billion. According to Kim, the plans were revealed during Moon’s meeting with Khaldoon Al Mubarak, chairman of the Executive Affairs Authority of Abu Dhabi, on Sunday. Under the plans, Korea and the UAE will seek cooperation in projects concerning fossil fuels, renewable energy, nuclear power, and agriculture. According to Cheong Wa Dae, the UAE has also offered its support to Korean entities’ bid to enter Saudi Arabia’s nuclear power market. Seoul’s presidential office said that the UAE has informed Saudi authorities about the quality of the work carried out on the Barakah Nuclear Power Plant, and that Korea is an ideal technology partner in relevant projects.